The Theme of 4th BIMSTEC Summit was 'Towards a Peaceful, Prosperous and Sustainable Bay of Bengal Region'. The theme will help shape a collective response to the common aspirations and challenges by the member countries. The 4th BIMSTEC Summit concluded in Kathmandu on August 31, 2018 with the signing and adoption of the Kathmandu Declaration by all the seven members. The Summit began on August 30, 2018 in Kathmandu, Nepal. Theme 2018: 'Towards a Peaceful Prosperous, and Sustainable Bay of Bengal Region'. The 18-point Kathmandu Declaration is expected to enhance the effectiveness of BIMSTEC Secretariat by engaging it in various technical and economic activities in the region. During the Summit, foreign ministers of BIMSTEC member countries signed a Memorandum of Understanding on the Establishment of BIMSTEC Grid Interconnection. Indian Prime Minister Narendra Modi, Sri Lankan President Maithripala Sirisena, Myanmar President U Win Myint, Bhutan's Chief Justice and Chief Advisor to the interim government Dasho Tshering Wangchuk, Bangladesh Prime Minister Sheikh Hasina, and Thailand's Prime Minister Prayut Chan-o-cha attended the Summit. • The Declaration stresses on ending poverty from the region by 2030 in line with the United Nations Sustainable Development Goals. • The declaration includes issues such as agricultural technology exchange, fight against terrorism, gradual reduction of the impact of climate change, increase trade and investment, and ease the visa processing for the people of BIMSTEC member states. • It strongly condemns terrorism in all its forms and manifestations and stressed that there can be no justification whatsoever for any act of terrorism. • It underlines the importance of multidimensional connectivity as a key enabler to economic integration for shared prosperity of the region. • It highlights the importance of trade and investment as one of the major contributing factors for fostering economic and social development in the region. Prime Minister Narendra Modi visited Kathmandu to attend the 4th BIMSTEC Summit on August 30, 2018. This was PM Modi’s fourth visit to Nepal during his current tenure with the most recent one in May 2018. • PM Modi reiterated India’s commitment to enhance its National Knowledge Network in Sri Lanka, Bangladesh, Bhutan, and Nepal, in the field of digital connectivity. • He invited all the BIMSTEC member countries to participate in the International Buddhist Conclave 2020 as the Guests of Honor. India will host the Conclave in August 2020. • He announced the establishment of the Centre for Bay of Bengal Studies at Nalanda University for research on arts, culture, maritime laws and other subjects. PM Modi also met other leaders on the sidelines of the BIMSTEC Summit and deliberated on various aspects of their bilateral relations. 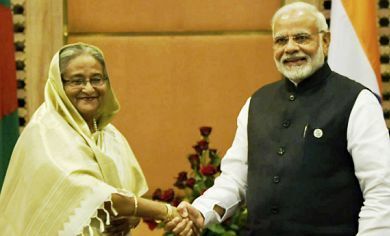 Modi interacted with Bangladesh PM Sheikh Hasina on the sidelines of the BIMSTEC Summit and reviewed the full range of India-Bangladesh relations and ways to boost economic as well as cultural relations. 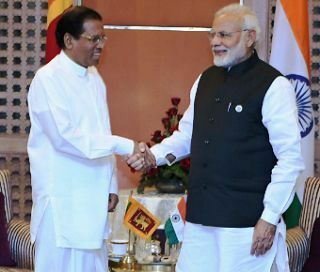 During his meeting with Sri Lankan President Maithripala Sirisena, he deliberated on various aspects of India-Sri Lanka friendship. 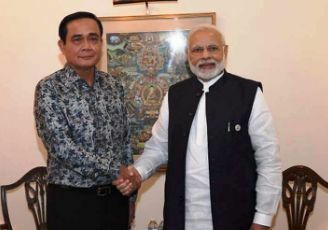 PM Modi and Thailand PM Prayuth Chan-ocha held talks on strengthening bilateral cooperation between India and Thailand. 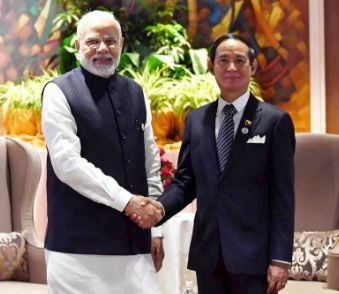 PM Modi met President Win Myint of Myanmar and had productive discussions on accelerating cooperation between India and Myanmar. PM Modi and Nepal’s Prime Minister KP Sharma Oli jointly inaugurated the Nepal Bharat Maitri Dharmashala at the Pashupatinath temple complex. The foundation stone to build the hospice in the Pashupatinath Temple premises was laid in 2001. The hospice is claimed to have facilities like that of a three-star hotel and the Indian Government has given assistance of 22 crore Nepali rupees. It can host about 398 pilgrims at a time, which has 82 rooms in total. The 16th ministerial meeting of BIMSTEC concluded successfully on August 29, 2018. Foreign Minister of Bangladesh Abul Hassan Mahmood Ali, Minister of State for External Affairs of India VK Singh, Union Minister of International Cooperation of Myanmar Kyaw Tin, Sri Lankan State Minister of Foreign Affairs Vasantha Senanayake, Foreign Minister of Thailand Don Pramudwinai, and Bhutanese Foreign Secretary Sonam Tshong led the delegations from their respective countries in the meeting. • The foreign secretaries of the BIMSTEC member countries met on August 29, 2018 for the 19th Senior Officials' Meeting (SOM) of the BIMSTEC and reviewed the progress achieved so far in the areas of cooperation. • The foreign secretaries discussed as to how cooperation between the member states could be made more effective and business-like. • They considered a number of reports of various mechanisms related to customs cooperation, connectivity, technology, counter terrorism and transnational crimes, agriculture, poverty alleviation and public health. • Several measures were deliberated in the meeting, including exploring the possibility of establishing BIMSTEC Development Fund, rationalisation of areas of cooperation, and identification of core prioritised areas. • The meeting recommended for a Memorandum of Understanding (MoU) for the establishment of the BIMSTEC Grid Interconnections to further cooperation in energy sector among the member states. • India laid emphasis on its sincere commitment to work with the BIMSTEC member states to make the region safer, stronger and prosperous. • Founded in 1997, the Bay of Bengal Initiative for Multi-Sectoral Technical and Economic Cooperation (BIMSTEC) is an international regional organisation of seven nations of South Asia and South East Asia. • The member countries of the Summit include Bangladesh, India, Myanmar, Sri Lanka, Thailand, Bhutan, and Nepal. All these seven countries lie near the Bay of Bengal. • Initially, the bloc included just four member states and was called BIST-EC (Bangladesh, India, Sri Lanka and Thailand Economic Cooperation). • Myanmar was included later and the group was renamed BIMST-EC. • The name was changed to BIMSTEC with the admission of Nepal and Bhutan at the 6th Ministerial meeting in Thailand in February 2004. • The first BIMSTEC summit was held in Thailand in 1997; second was held in 2008 in India; and the third was held in 2014 in Myanmar. • Nepal is the current Chair of the BIMSTEC. Nepal assumed the chairmanship in 2014. • The grouping accounts for 22 percent of the global population, and has a combined GDP of USD 2.8 trillion.